A campaign group fighting to keep the UK in the EU has received £400,000 from billionaire investor George Soros. Mr Soros made his donation to Best for Britain through one of his foundations. The Daily Telegraph says the group will launch advertising later this month to rally public opinion and convince MPs to vote against the final Brexit deal. 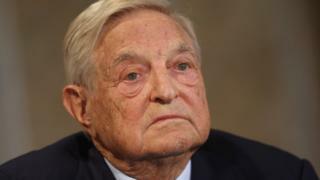 Best for Britain chairman Lord Malloch-Brown, a former Labour minister, said Mr Soros was a "valued" supporter but small donors had contributed more. Mr Soros, a Hungarian-born US citizen, made a fortune in 1992 betting against sterling on Black Wednesday, forcing then-PM John Major to take the pound out of the European Exchange Rate Mechanism. He has previously suggested it was possible that the UK would apply to rejoin the European Union soon after Brexit. Best for Britain was co-founded by Gina Miller, who took the UK government to court in 2016 over its triggering of the Article 50 process to leave the EU. A judge ruled Parliament must give its consent before Theresa May can start official talks on the terms of the UK's exit. Mrs Miller left Best for Britain last June. Lord Malloch-Brown confirmed Mr Soros's contribution but said some of the campaign's other major donors had given more. He added Best for Britain had followed rules governing financial contributions. He said: "We have never hidden our agenda; we have been campaigning hard to win a meaningful vote on Brexit, which we did, and to keep all options on the table, including staying in the European Union." He said the campaign was a "democratic and patriotic effort to recover our future and we welcome support for our efforts from many quarters". The involvement of Mr Soros was reported in the Daily Telegraph in a story co-written by Theresa May's former chief of staff Nick Timothy. In an article in the paper, Mr Timothy maintained the objective of the campaign was "to convince MPs to vote against the deal Theresa May negotiates with Brussels, regardless of its content". He said: "Malloch-Brown and his backers believe that, if Parliament rejects the Brexit deal, the government will fall, and Brexit can then be stopped." Reality Check: How soon are Brexit answers needed? A quick guide: What is the Brexit transition phase?